"So you're constantly on the road, traveling all over the place," an acquaintance recently remarked. "Where's the best food?" That's an interesting question for us, because generally we avoid eating meals at chain establishments, with their generic menus that are pretty much the same all over the US -- or the world. We prefer instead to patronize local establishments and sample the local culture. It's not always easy to stay away from the chains, particularly on travel days. Take today, for example. Breakfast was coffee and a muffin from Sheetz (a fuel stop/convenience store popular in Virginia and Pennsylvania). Yesterday, however, we each had coffee and a buttered roll from Renee's Hot Stuff Deli, in Montgomery, New York. Mmmm ... those buttered rolls. Doesn't sound like much, 'til you try 'em. But only in New York! Where's the best food, you say? Well, New York does have a lot to offer; they do have the best buttered rolls, hands down, and any New Yorker will sing the praises of New York style pizza. Fact is, in New York good Italian food is practically a guarantee ... but they don't have the best Cuban food; that distinction belongs to La Teresita, in Tampa, Florida. Certain areas of New York offer the most amazing Chinese food ... but El Pirata, in Arcadia, Florida, will amaze you with their Mexican food. Long before I'd ever even imagined doing a craft show in the High Country, I'd come to this area as a sightseer. The building that houses the Highland House Ski Shop, pictured above, has delighted me as a landmark for as long as I can remember. It's at the intersection of Highway 105 and Highway 184; once upon a time this group of buildings was a rather lonely little beacon that signified you'd come to the road leading up to Banner Elk and Beech Mountain. Now it's one of many buildings in a shopping area called Grandfather Village, in the shadow of Grandfather Mountain. 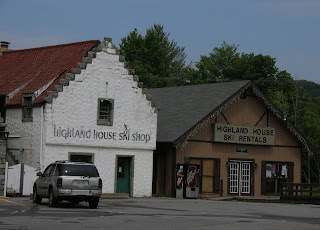 Charming as the Highland House Ski Shop is, it's not the most noticeable architectural feature of the immediate area. I'd have to say that designation belongs to a high-rise condo that is perched atop nearby Sugar Mountain. That huge, glaring white building is visible for miles -- and while it may offer its occupants a spectacular view, it is a jarring sight to anyone else. A monument to someone's failure to blend with the environment, it should be a mandatory field trip for every student of architecture -- Just because a thing can be done, doesn't mean it should be done. Look at what you shouldn't do. If you're curious about this monstrosity, you can look it up for yourself -- I don't want a picture on my website as a constant reminder that there are people out there who have such disregard for the natural world! Greg and I went into Banner Elk for errands today, and, on a whim, we checked out the Grandfather Campground. That's where I managed to get this photo of Grandfather's profile. I'd almost despaired of being able to get a nice picture of Grandfather Mountain, as it seemed I was never in the right place at the right time. 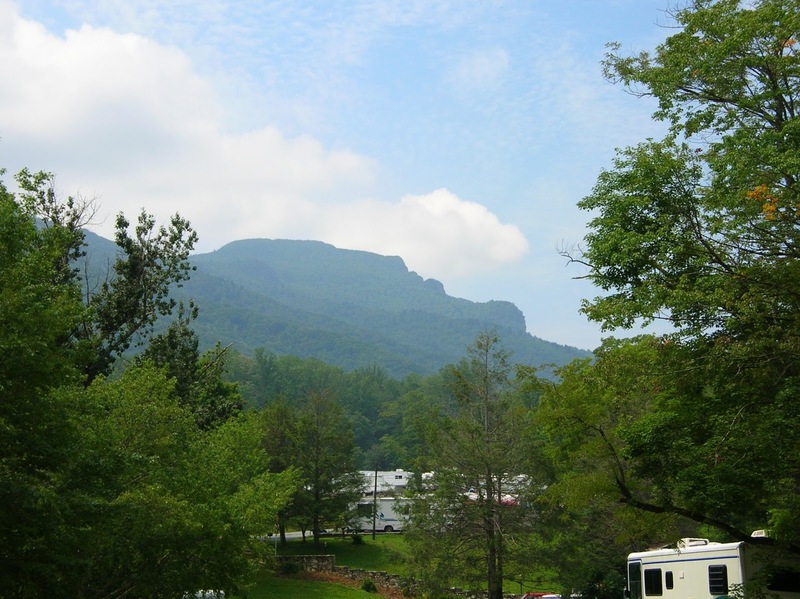 Grandfather is the highest peak in the Blue Ridge Mountains, and is certainly one of the most recognizable peaks in the world. I read recently that there are smooth round stones, like the ones you'd find in a riverbed, near the top of Grandfather. If they're commonly found at the bottom of a river, how'd those stones get on top of a mountain? Geologists say that 750 million years ago, these rocks were carried by rivers and deposited in a valley. A continental collision pushed that valley upward, making it into a mountaintop. Amazing. There are so many other fantastic natural features in this world, many (if not most) of them created by similarly cataclysmic events. I once asked my father, a man of science who was a devout Christian, what his beliefs were with regard to the creation of the world -- there are Christians who flatly deny that anything on Earth can be more than a few thousand years old ... as there are scientists who offer geological evidence as proof that the Bible is false -- what did Daddy believe? We were standing on the rim of Tallulah Gorge at the time, reading about the forces of nature which produced this deep gash in the Earth's crust anywhere from 250 to 500 million years ago. Without hesitation, Daddy referred to the second verse of the first chapter of Genesis: "And the earth was without form, and void; and darkness was upon the face of the deep." No timeline is offered, nor even implied, in this portion of the creation story, Daddy said, so it more or less rendered moot any argument by either side: the passage does not rule out the possibility of seismic events and floods which occurred hundreds of millions of years ago, thus -- in this instance, at least -- there is no conflict between belief in science and belief in the Bible. Oh. He sure had a way of explaining tough concepts in a way that even a child could understand!